There are eight finalists on the international Silent Book Contest 2017. Here are some picture from the exhibition in Bologna Children's Book Fair. Walter Fochesato (president), Patrizia Zerbi Monti (publisher Carthusia), Emanuela Bussolati (illustrator/Italy), Mariana Ruiz Johnson (illustrator/Argentina), Gabriel Pacheco (illustrator/Mexico), Antonello Silverini (illustrator/Italy), Gianni De Conno (illustrator/Italy). Thank you so much! I'm incredibly happy! Discover the book finalists at Bologna Children's Book Fair, April 3rd 2017 h 15,20 : Cafè Illustrators with the Authors Finalists and the International Jury and, to follow, h. 17,00 Opening Exhibition, space SBC 2017 hall 26 and cocktail. 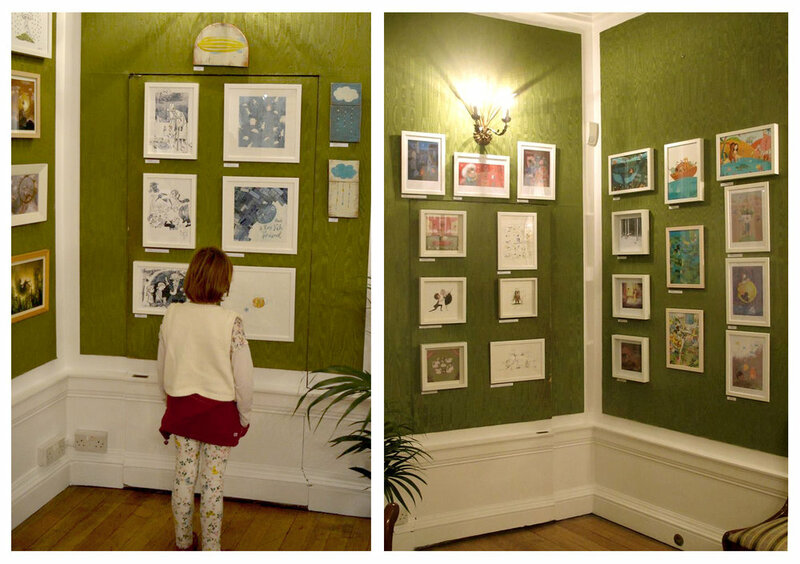 Last November there was an exhibition of Hungarian illustrators in Hungarian Cultural Centre, London. Here are some photos from the opening and a Kodály-based music session which was organized in the same hall. 'Cricket on the Moon and other stories' is the title of my upcoming exhibition at József Attila Művelődési Ház, Göd (Hungary). There will be a lot of selected illustrations from the last six years. Opening this Friday 6 PM. Yesterday the Beautiful Hungarian Book Prizes were handed over to the winners. Our book 'Heart Outgrown' written by Imola Julianna Szabó won the Certificate of Merit by the jury in the category of youth and adults' literature. The jury chose from the published books of last year in eight categories. The award ceremony was at the Petofi Literary Museum, in Budapest. This lovely book written by Judit Magos won the 'Golden Book 2016' prize in category 'educational literature' based on readers' votes. The story is about early life of Demény (the Hungarian Short-haired Pointing Dog celebrity) and his wandering on the streets before he has been rescued. Our new book has released. It's a methodological guide for using paper-theater. Krisztina Simon and I will participate in the Festive Book Week Budapest on Sunday for a dedication if you are interested in it. I am working on a new paper theater tale about transformations of a waterdrop. Just a little sneak peek. Yesterday I received the 'Dragonfly' Magazine which contains two double pages with my illustrations. what does the fox wear? Last year I decided to realize some objects from my earlier ideas. For example: diaries or stationery... and my oldest most wanted project: A BOARD GAME! Well, as I made some diaries and agendas and finally had a chance to create a board game design in 2015 (you can see it at 'works' section) then I created this paperdoll dressing game. Although the how-to part of the process wasn't simply at all it was so much fun to make it! hey, bunny! look at my new sunglasses! you can play with us as shadow puppets as well.